Read the Ferrari 559 GTB Fiorano coupe (2006 - 2012) car review by Auto Trader's motoring experts, covering price, specification, running costs, practicality, safety and how it drives. Ferrari’s 599 GTB Fiorano flagship serves up astonishing pace from its Enzo-derived V12 yet also delivers surprising comfort. It all adds up to a crushingly capable supercar. Interested in buying a Ferrari 599? The Ferrari 599 GTB Fiorano follows Ferrari’s edict for form following function, so it’s perhaps not a classically elegant beauty. That means it’s designed to be aerodynamically efficient, with every scoop, vent and surface honed to deliver the best possible means of dealing with the air the 599 so easily punches through. There is some form in that function though. The neat flying buttresses at the rear and scalloping along its flanks add visual interest, though the 599 GTB Fiorano is purposeful rather than pretty. No two 599s leave the Ferrari plant with the same interior; such is the level of personalisation on offer. Leather, seat types, carbon finish packs and even a steering wheel with gear shift lights – like an F1 car – are offered. The basic architecture is good though, with four circular vents spouting out of the dashboard and drilled aluminium pedals situated under the large, sculpted (and starter button equipped) steering wheel. It’s a nice place to be, but those extras aren’t cheap, and the supplementary screen among the main dials is more etch-a-sketch than iPad in its graphics. 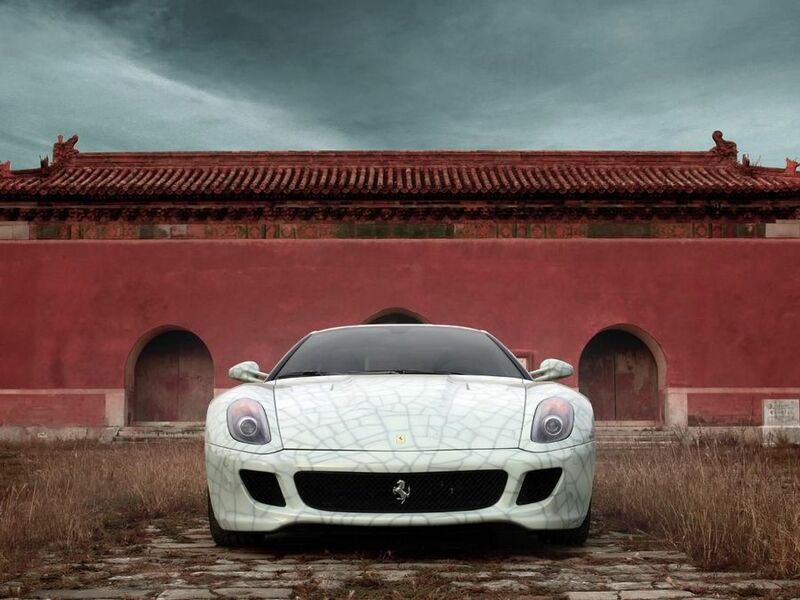 The 599 GTB is loaded with technology and that carries through to its dampers. They’re filled with magnetic fluid, which offers near infinite variability when an electric current is passed through it. The result is a car that’s able to tackle both tortuously twisty and bucking back roads with amazing composure, yet corner flatly when pushed hard on a track. It’s this as much as anything that makes the 599 GTB so accessible, and so easy to exploit. Those wanting more focus can select Ferrari’s optional ‘Handling GTE’ pack, which does exactly as you’d expect it to. That the 6.0-litre V12 under the bonnet of the 599 GTB Fiorano is basically the same engine that powered Ferrari’s Enzo supercar should tell you something about the performance on offer. There’s lots of it, and the quoted 612bhp figure feels conservative when you push the accelerator to the floor. Use the launch control and it’ll reach 62mph in just 3.7 seconds and the official top speed is 205mph. The transmission is a paddle-shifted system, it firing through its gears with real precision at speed, though sometimes a bit clumsy around town. If you have to ask… Running any exotic Italian car is potentially financially ruinous, and the flagship model more so than most. Insurance, road tax, fuel, servicing, tyres and all other costs will be far more than anything ordinary, but then you’re driving an extraordinary car. If you’ve the money required to buy it in the first place then it’s highly improbable you’ll baulk at the running costs – though the numbers look terrifying to mere financial mortals. Ferrari has taken a leaf out of its F1 team’s book regarding reliability. Back in the bad old days Ferrari’s F1 cars struggled to finish races; now they lead from the front and finish virtually all of them. The road cars have followed: Ferrari’s confidence allows it to offer warranties on approved used cars, as well as free roadside assistance. If you happen to breakdown somewhere remote you can always call your pilot and helicopter to pick you up, too. It might have hypercar power, but the 599 GTB is a cinch to drive. A steering wheel mounted toggle offers the ability to select the amount of electronic intervention from the stability and traction control systems. It’s best advised to leave it all turned on when on the public road. Airbags, massive carbon ceramic brakes equipped with ABS and a super strong structure should keep you safe, too. It’s a Ferrari, which means the list price is just a starting point. The basic standard specification covers exactly that – the basics – so bank on spending a lot more. Even the Ferrari shields on the wings are optional and you’ll pay more for a coloured speedometer. It’s well worth paying extra for the HGTE handling pack as it adds not just suspension revisions, but different wheels, some carbon interior trim and carbon fibre backed sports seats – all for a reasonable premium. Because you can. The 599 GTB Fiorano might be a supercar of the highest order, but it’s also surprisingly useable. It’s easy to drive in traffic, and blends in quite unlike the Lamborghini alternative. If you want the ultimate then there’s the GTO version, which revives the revered badge and adds some insanity to the 599’s performance, while there’s also an open variant offered – the SA Aperta. Both the GTO and Aperta are limited-run machines, with price tags to match, so don’t be worried if you can’t have one – as the standard 599 is among the most rounded supercars ever.